They usually point to Sweden or Denmark, but I point out that Sweden and Denmark became rich in the 1800s and early 1900s, when government was very small. 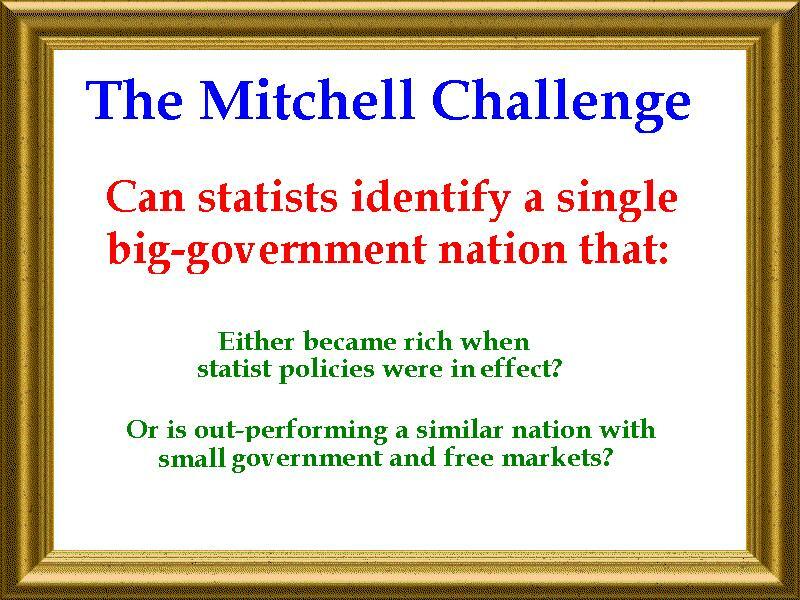 So if statism isn’t the right approach to achieve prosperity, how can poor nations become rich nations. I’ve offered my recipe for growth and prosperity, but let’s look at the wise words of Professor Deirdre McCloskey in the New York Times. Deirdre then explains that classical liberalism produced this economic miracle. Deirdre’s analysis is critical. She reminds us that investment doesn’t merely depend on good tax policy and rule of law doesn’t magically materialize. You need a form of societal capital as the foundation. Anyhow, to show how good ideas changed the world, this chart show how classical liberalism is the key that unlocked modern prosperity. You may have already seen a chart that looks just like this. It was in a video Deirdre narrated. And Don Boudreaux shared a similar chart in one of his videos. I think it increases economic understanding if instead of thinking of it as increased “income” we think of it as increased productivity and increased purchasing power. The reason is that socialist liberals suffer under the delusion that merely redistributing “income” will reduce “poverty.” The economic reality is that what the communist liberals are redistributing is the fruit of productivity and the resulting purchasing power. Somehow the delusion has to be overcome. Nigel, I agree with you in theory, especially the year-to-year change. But I don’t think it changes the long-term ‘big picture’ conclusion. The bottom line is massive explosion of incomes after 1800. I went to the source, recreated the chart and changed to log scale. Unfortunately, I can’t seem to copy it here in this comment box. As presented, Max Roser’s plot of “Real GDP per Capita Around the World …” is of negligible worth. 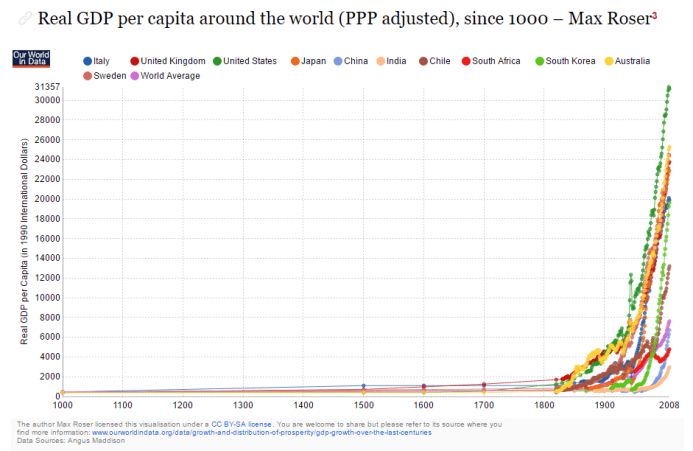 This in comparing different countries, and their shorter-term growth rates, over a time-scale of hundreds of years. Just look at how the differences are overwhelmingly undistinguishable before 1800. If the plot were given with the vertical scale being the logarithm of GDP per capita (whether PPP adjusted or not), the short-term relative changes would be sensibly presented over the whole time-scale of the plot. This deficiency (not using a log-value scale for plots over a long period) is, IMHO, far too common with economists – which is a serious disappointment. The need is for plots that do not over-emphasise the contribution of inflation (and/or inaccuracies in its indexation) and present (relatively short-term) growth or contraction substantially equally across the longer time-scale. Japan used to be one of the freest countries in the world. Top 10. Your point is probably more correct about S Korea, but even they have ranked fairly high. I’m talking about economic freedom. Having said all that, it’s possible that a benevolent dictator could produce good results if he chose all the right policies. It’s just that benevolence coupled with competence is rare, so it’s usually a bad idea to have too much power in the hands of government. It does look from here as though both Japan and South Korea went from poor to rich under the command economies they have now. I hope I’m wrong, but please shoot this down if you can. PPP is nonsense. Wikipedia writes India has GDP Per capita PPP $7,795 and nominal (read real) $2,016. Wik also writes PPP is Neoclassical economics which with Keynesian economics dominates microeconomics. Are you a Keynesian? Nobody knows this better than the Globalists, but, because they are the demon infested winged monkey servants of Satan, they take great pains to steer clear of liberty and justice and anything else that might make the lives of regular people better. The Globalists hate regular people and want them to be poor and miserable. The misery caused by socialism and communism is not a bug, it is the primary feature and purpose of the program. The Globalists use socialism and communism as an Orwellian tool which allows them to grind their boots in to the face of humanity, and they will grind their boots in our faces until we admit the truth of the situation. It’s a waste of time to try to explain to them what they are doing “wrong.” To them it is not wrong.